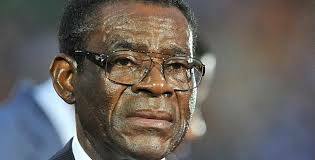 Africa’s longest-serving leader, President Teodoro Obiang Nguema, was set to extend his 36-year hold on power Sunday as the tiny oil-rich nation of Equatorial Guinea went to the polls. Initially scheduled to be held in November, the vote was brought forward following a presidential decree, with no reason offered for the change. Obiang, now 73, has ruled the west African country with an iron fist since 1979 when he ousted his uncle Francisco Macias Nguema, who had ruled the country since independence from Spain in 1968, in a coup and had him shot by firing squad. The president voted late morning in the race which pits him against six other candidates, but with Obiang almost certain to win, the main opposition parties have boycotted the poll. In the last election in 2009, he was returned to office with a sweeping 95.37 percent of votes and was confident of victory once again. “I can’t tell you the percentage, but we are going to win,” he told reporters. “It is the continuation of what Equatorial Guinea is today. That is to say our country is a benchmark in democratic terms… it’s an example.” Obiang’s regime has frequently come under fire from human rights groups for suppressing dissident voices and the media, as well as for widespread corruption. Equatorial Guinea has become sub-Saharan Africa’s third biggest oil producer in recent years, with oil revenues accounting for more than 70 percent of national income. But the wealth has not trickled down. While per capita national income stands at over $10,000, more than half the population lives on less than two dollars a day. The incumbent is running as head of a coalition of 10 parties that includes the ruling Democratic Party of Equatorial Guinea. His adversaries in Sunday’s vote, which ended at 6:00 pm (1700 GMT), are mainly newcomers and figures with very little political weight. Results are not expected until Thursday. The Democratic Opposition Front (FOD) coalition of dissident groups called on March 23 for a boycott of the vote, saying it would be rigged. Andres Essono Ondo, whose Convergence for Social Democracy (CPDS) group is part of the FOD, said numerous “irregularities” surrounded the poll, which he said would ensure that “President Obiang wins with a big score as a result of fraud”. The CPDS, the only opposition party represented in parliament, said it “will not recognise the president elected in the poll”. The opposition condemned the lack of an independent electoral commission as well as the regime’s grip on the media. Another FOD member, Guillermo Nguema Ela, branded the election “anti-constitutional”. Obiang and his government “do not respect either the constitution or the law”, Ela said in March. Obiang has called himself “the candidate of the people”. “Whoever does not vote for me is rejecting peace and opting for disorder,” he said at a rally in the capital Malabo when he launched his campaign. “Many say that they are tired of seeing me, it’s been 36 years already. True, but I’ve dedicated my life to this country,” he said.